Sunripe Marmalade is made from fresh ingredients following our timeless traditional recipe. Delicious on breads or biscuits, it is a delightful treat with wholesome goodness for the young and old alike. Sunripe Marmalade is a good source of carbohydrate derived from cane sugar and natural fruit sugar. 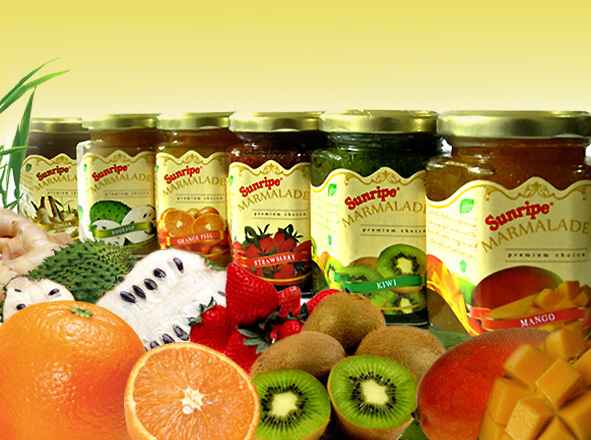 A tastier, healthier choice with plenty of fruit in it, Sunripe Marmalade is now available in six mouth-watering flavors: Mango, Ginger, Kiwi, Strawberry, Orange Peel, and Soursop. Available in 200 gr jar, 2 kg pail and 5 kg pail packaging. If you are interested in ordering this product in bulk, please take a look at our wholesale page. If you have your own marmalade products in mind and are looking for a reliable manufacturing partner, we can also formulate special flavors in unique packaging to your specific requirements. Kindly email us at oem@sunripe.com.sg with your interest and we'll get back to you shortly.